In Williams Shakespeare's Hamlet, Hamlet says to Horatio in Elsinore Castle at his mother's wedding "In my mind's eye"(act 1, scene 2, line 185). 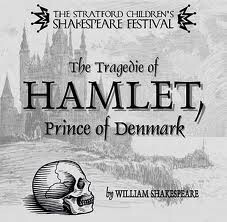 Horatio comes in and begins talking to hamlet about his mother's wedding and Hamlet mentions he saw his father, when Horatio asks him where Hamlet says "in my mind's eye", in other words; his imagination. Hamlet is saying this because he misses his father and now he has almost no time to grieve his loss. His tone is angry and sad and this reminds Horatio that the guards had seen his father's ghost, this information then makes hamlet want to see the ghost for himself. The underlying meaning of this elaborates on how Hamlet is feeling.He is saying he misses his father and he is trying to not seem so sad but he really is.This whole scene sets up the next chain of events and allows Hamlet to see the truth.